Depending on the water system being used spillage can be reduced with up to 50%! piglets < 30kg 66mm 1/2"
calves < 160kg 79mm 1/2"
cattle < 300kg 97mm 3/4"
cattle < 300kg 97mm 1/2"
calves < 160kg 75mm 1/2"
An innovative and cost saving drinking system. We all know the high costs associated with water spillage. Depending on the water system being used spillage can be reduced with up to 40% or more. The installation of AquaGlobe bite ball valves will lower spillage and therefore pay for itself in a short time. The valves ball is placed far enough from the outlet of the valve, which means that the animal has to take the valve fully into its mouth before water can be released. The capacity of the valve is also adapted to the animals’ drinking requirements and water can not be released by the animals’ scratching themselves on the valves. All in all, this will reduce water spillage, thus giving a better stable environment - lowering your wastage disposal and water spillage costs. Savings with bite ball valves. The valves ball is placed far enough from the outlet of the valve, which means that the animal has to take the valve fully into its mouth before water can be released. The capacity of the valve is also adapted to the animals’ drinking requirements and water can not be released by the animals’ scratching themselves on the valves. All in all, this will reduce water spillage, thus giving a better stable environment - lowering your wastage disposal and water spillage costs. Anatomically designed. Bite valves should be designed according to the animal’s anatomy. It should be natural for the animal to grasp the valve into its mouth. The AquaGlobe bite ball valve has a round design and a pressed tip, which slows down the water speed and makes it natural for the animal to drink efficiently. Because of the ball and how it is placed, it is very easy for the animal to learn to drink quickly. Hygienic drinking system. Hygiene and water quality are important factors for the production result. It is necessary that every surface on the valve is used and that it is fully accessible by the animal, so that bacterial growth can be avoided. 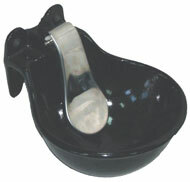 Drinking bowls and other types of valves invite bacterial growth. The AquaGlobe bite ball valves guarantee maximum hygiene. Reliable and durable quality. The unique ball design makes the valve self-cleaning and the big screen efficiently prevents problems caused by particles in the water. Since bite valves take a lot of abuse, all moving parts are made in high quality stainless steel. It is very important that the piglets locate the water and start to drink as fast as possible. AquaGlobe has for this purpose developed new trainer valves to accomplish fast learning. The valves has a screw that easily can be adjusted to drip. When the piglets have located the water and started to drink, the screw can be adjusted back to stop the dripping.